Martin Pierce Hardware customizes their unique door hardware for a new home in Washington State. Stunning, nature inspired door handles by Martin Pierce proved the perfect choice for entry door hardware for a new stately home in upscale Tumblecreek, Washington. 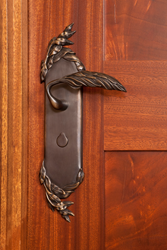 The project was built under the supervision of Myron Abrams of MA Abrams Construction with interior designer, Tracy Abrams, who chose many pieces from Martin Pierce’s Willow collection of bronze door handles. The Willow series was a perfect choice says Pierce, for this natural paradise where rolling hills are home to pine, silver birch and larch trees. Tracy Abrams used many of the Willow bronze door handles for interior passageway and privacy doors and also made extensive use of the Willow collection of bathroom accessories and cabinet pulls. Tracy also commissioned Martin Pierce to make his Hedgerow style of dining chair and bar chair and chose a textural chisel detail to continue the natural theme of the interior.